While it may look like mere child’s play to you, play is the business of childhood and is instrumental in developing problem solving and social skills as well as nurturing their imagination and advancing physical development. The toys our kids play with determine how they perceive themselves and interact with the world and are integral in communicating values. Instead of letting your kids be blindsided with every trending toy this Christmas or birthday, ask yourself what skills these toys will develop? Will the toy last and grow with your child? 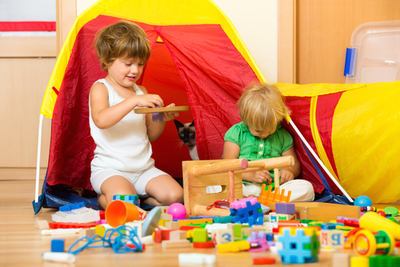 Does the toy encourage creative thinking and cooperative play? Consider these 7 benefits of educational toys and how fewer toys in the toybox might encourage resourcefulness and develop longer attention spans in your kids. From birth children explore and relate to the world through play. Firstly discovering their own body and immediate surroundings, then through more structured activities and physical tools like toys. Toys are more than just fun and games though and need to provide an opportunity for children to learn and engage with others. Problem solving toys build creative and critical thinking enabling children to analyse a problem, come up with multiple solutions to the problem and compare these solutions. These skills will build confidence through their ability to apply reasoning and logic to resolve issues. Combining the enjoyment of play with educational outcomes allows your child to practice and study their talents over a longer time frame. This means they achieve a more detailed understanding of the skill they are developing, whether they are improving literacy, memory retention, motor skills or hand eye coordination. Once the flashing lights go out and the electronic voices fade away, children lose interest in toys pretty quickly. Although not every educational toy will engage your child, once a toy caters to their preferred learning method, be it visually or kinetically, the desire to play inadvertently also become the desire to learn. Popular toys engage children with flashing lights and diverting sounds to encourage interaction. However, educational toys can be played together with another child or adult and offer a valuable insight into the child’s individual personality and development. Children are creative by nature as they interpret new objects and experiences. Educational toys can boost that creativity by nurturing it in a multitude of different ways and encouraging children to express their creativity through art, craft, building, music and science. 7. Open Ended Play - Endless Possibilities! When you invest in educational toys, they should be durable and versatile enough to grow with your child. Rather than coming with a set purpose and limited use, the uses and applications for these toys expand to connect with a broad range of age groups as your child’s mental and physical abilities grow.